The QUEMIC service offering stems from the basic principles of safety & security. Where Safety is defined as the freedom from harm or danger, Security is the freedom from intentional harm or danger. Security is thus a condition that results from the establishment and maintenance of protective measures that ensure a state of inviolability from hostile acts or influences. 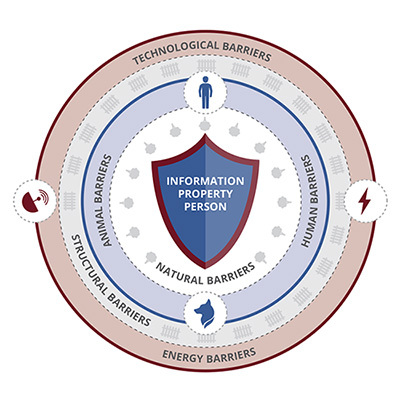 QUEMIC’S hybrid model of protection is therefore the arrangement of a combination of different but complimentary layers or barriers (natural, human, animal, mechanical, energy, technological and psychological) to deter, delay, deny, detect, defend or defeat unauthorised or unjustified access and harm to persons, property, information and reputation; the intensity of such measures depending on the threat or perceived threat and within available resources and budgets. It is within this environment that QUEMIC have been providing for almost 20 years a superior integration of knowledge, experience, capability and methodology. We support the view that the right system is not so much chosen as created, which underscores an approach where collaboration and joint planning is used as a trigger for commitment and creativity. The achievement of QUEMIC excellence requires a widespread competence among people and an environment which encourages and enables the expression of that competence. In this sense people refer to the employees of QUEMIC as well as their customers, who need to operate and cooperate as one integrated team. The competence connection for QUEMIC as a ‘business centre of excellence’ is therefore founded by individuals who can give expression to our competence. Excellence is truly our goal, and the management of QUEMIC work together for a state of unsuppressed competence where we can truly express pride in all we do. The personnel component of the company is hand-picked, well-trained and the QUEMIC business practices and principles vested in ethical-based conduct. QUEMIC draws upon a wealth of experience gained in the service of government law enforcement agencies, departments of defence and multi-national companies. This experience allows QUEMIC to swiftly evaluate any task imposed on them and to ensure that the service, which it provides, will more than meet the requirements of the client. QUEMIC will be the most admired and innovative centre of excellence for integrated risk solutions in Southern Africa. QUEMIC is a uniQUE and dynaMIC company that seeks to enhance the protection of its clients’ personnel, services and products to an above average level, by means of purposeful and cost-effective risk solutions. QUEMIC is committed to the highest quality service within the safety and security environment. This is achieved by integrating innovative ideas with highly skilled and dedicated personnel, cutting edge technology and tested procedures.